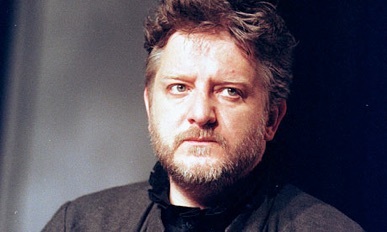 The primary reason John Caird's production of HAMLET has been playing to full houses is the performance of Simon Russell Beale in the title role. Beale is just the opposite of the tall, slender, handsome neurotic that has become the caricature of this part. Instead of seeing extraordinary events happening to an extraordinary man, this HAMLET shows extraordinary events happening to an Everyman. The gains in playing Hamlet this way are enormous. No longer are we watching some rarified study in psychology but an ordinary man whose every action is understandable and whose life is only more tragic because of this. When Beale speaks, every line is clear and natural--every line seems new. Lines that never made sense before now make sense. The famous soliloquies flowed from the dialogue that went before and were not underlined (as so often with Shakespeare at the Canadian Stratford) by a change of light or accompanying music. Beale's performance and Caird's direction give the play a clarity I've never experienced before. All foolish interpretations are cast aside: Hamlet is not mad and never is. Hamlet treats the Ghost as a ghost not as his father. Hamlet is not in love with Ophelia. She is also not in love with him (only her father thinks so). In "To be or not to be", Hamlet is musing on death but not contemplating suicide, and so on. One cliché after the next is exploded so that every previous performance you may have seen seems false. Simon Russell Beale may stand out, but Sara Kestelman is also the best Gertrude I have ever seen and Cathryn Bradshaw the best Ophelia. In this closet scene Hamlet does not change Gertrude's view of herself because it has already changed, an interpretation that avoids making her seem hopelessly foolish. For the first time I hung on Ophelia's every word in her mad scene, clad as she was in her father's cloak, instead of wishing, as usual, that she'd hurry and drown herself. Yet, there were aspects of the production that were not so clear. Why do all the characters seem to be wearing clerical robes? Why does the scenery consist entirely of trunks and suitcases? Is this to pick up the travelling metaphor in Hamlet's speeches? Why has everything to do with Fortinbras been cut? Why does the play begin and end with all the characters in niches in the walls lit to look like portraits, whence they step à la G&S’s Ruddigore onto the stage? Is the play before us being enacted entirely by ghosts? Fortunately, the acting is so powerful and the action so clear, these questions tend to pale in significance. This is the best directed and best performed HAMLET that I have ever seen. Photo: Simon Russell Beale as Hamlet. ©2000 Tristram Kenton.